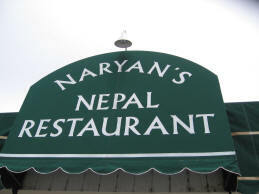 Good, basic Indian and Nepal food. This place seems a little gimmicky when you first walk in, what with the couple hundred stuffed trophy animals in the dining room ... BUT, the food is excellent. And the food is meat. I haven't tried the Rocky Mountain Oysters yet ... I am not sure I will. You'll be wondering about your directions as you drive through questionable neighborhoods to get here. The new Denver light rail has a stop across the street and that might be an option. Here is a hole-in-the-wall with excellent Mexican food -- a little spicy, but very, very, good. This is a chain ... 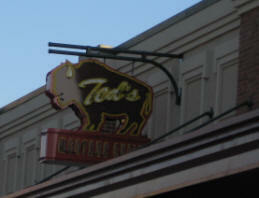 It was pretty good though ... supposedly owned by Ted Turner, the place specializes in Bison. They say no freezer or no microwave in the building. I had the meatloaf. The bartender served a valid drink. A very good, near the airport, option. No yachts in sight -- great food, nice lively environment. Not exactly a BBQ place. Nice, rustic dished -- I had trout, excellent. 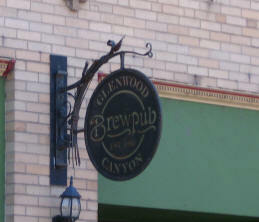 Nice beers, a good atmosphere, excellent food. I had the brat, beer pretzels and a nice Bavarian brew. There was a line for lunch on a Thursday. Look for her at events in the "Western Slope" ... Excellent dogs, boiled, then grilled. I had five polish dogs, kraut, special mustard, relish and a little strip of catsup in three days. At various events like Country Jam. 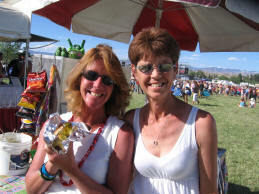 Mindy and Donna at Country Jam, 2006.